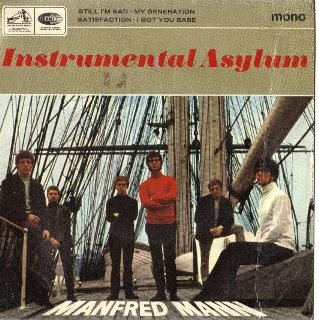 Being no strangers to jazz Manfred Mann threw the pop world on it's ear(s) in 1966 when they released "Instrumental Asylum", an E.P. chock full of jazz versions of currents "pop" hits of the day. By now the band were on the verge of losing lead singer Paul Jones. The multi-instrumental guitarist Mike Vickers had already jumped ship. Bassist Tom McGuinness had shifted into his place with his bass vacancy being briefly filled by Jack Bruce who'd recently left the Graham Bond Organization. With Manfred on keyboards and Mike Hugg on drums the band were complimented by a two man horn section comprised of Henry Lowther (trumpet/flute, later to join Georgie Fame in 1967) and Lyn Dobson (saxophone). Upon it's release the E.P. was both praised and savaged by the U.K. music press, this mattered little as it went on to become the band's least successful (sales wise) E.P. on HMV, and also their last for the label. Ex-Band of Angel's lead singer Mike D'Abo joined to replace Paul Jones and the band switched labels to Fontana. The arrangements on the E.P. vary. The E.P. kicks off with The Yardbird's "Still I'm Sad" which swings (rather heavily I might add) thanks to some great solos by Lowther and Dobson who pretty much carry the tune and some heavy ivory pounding by Manfred. "My Generation" is barely recognizable from The Who's amphetamine mod stutter "anthem" until the vibes play the melody of the chorus (I'm curious who it was as the band's previous "vibes man" Mike Vickers was gone) before it returns back to Bruce's speedy bass runs backed by some fine horn work. Sonny & Cher's pedestrian "I Got you Babe" is turned into a cheeky, sped up elevator jazz project with Lowther and Dobson again receiving the accolades making it, in the words of a great jazz Lp "a swinging affair". The group's swipe at The Rolling Stones "(I Can't Get No) Satisfaction" is a wonderful number. It's a mish mash of the powerful horn section (with a wonderful solo by Dobson as he trades licks with Manfred's B-3 and also a nice solo by Lowther), football terrace like "chants" by the band of "hey hey hey that's what I say" during the breaks and some over the top fuzz guitar by McGuinness right afterwards! Brilliant. The band returned the to " jazz versions of pop hits gimmick" (though less exciting) later in the year on Fontana with another jazz themed E.P. titled "Instrumental Assassination" (TE17483). All four selections from the "Instrumental Asylum" E.P. can be found on the LP "The Soul Of Mann" which has been reissued on CD by EMI bearing both mono and stereo versions of all of the cuts on one disc. Great review of Instrumental Asylum, which when I'm in the mood, is one of my favourites. Jack Bruce, in coversation with Paul Jones, said he got £30 for arranging the tunes. He thought he would become a millionaire when he joined The Manfreds! Mike Hugg payed the vibes, Mike Vickers guitar, saxophone and flute.